If you read the Evaluating R Language Code to this guide you already know how to execute R code from a Java application. In this chapter we will take things a little further and explain how you can move data between Java and R code. Renjin provides a mapping from R language types to Java objects. To use this mapping effectively you should have at least a basic understanding of R’s object types. The next section provides a short introduction which is essentially a condensed version of the relevant material in the R Language Definition manual. If you are already familiar with R’s object types you can skip this section and head straight to the section Pulling data from R into Java or Pushing data from Java to R.
R has a number of objects types that are referred to as basic types. Of these, we only discuss those that are most frequently encountered by users of R: vectors, lists, functions, and the NULL object. We also discuss the two common compound objects in R, namely data frames and factors. Before we discuss these objects, it is important to know that all objects except the NULL object can have one or more attributes. Common attributes are the names attribute which contains the element names, the class attribute which stores the name of the class of the object, and the dim attribute and (optionally) its dimnames companion to store the size of each dimension (and the name of each dimension) of the object. For each object, the attributes() command will return a list with the attributes and their values. The value of a specific attribute can be obtained using the attr() function. For example, attr(x, "class") will return the name of the class of the object (or NULL if the attribute is not defined). As you can see, even single numbers are vectors with length equal to one. Vectors in R can have missing values that are represented as NA. Because all elements in a vector must be of the same type (i.e. logical, double, int, etc.) there are multiple types of NA. However, the casual R user will generally not be concerned with the different types for NA. R’s typeof() function returns the internal type of each object. In the example above, y is a character vector. "C" "B" "B" "C" "A" "A" "B" "B" "C" "B"
Internally, the factor in this example is stored as an integer vector c(3, 2, 2, 3, 1, 1, 2, 2, 3, 2) which are the indices of the letters in the character vector c(A, B, C) stored in the levels attribute. In R, lists are also known as generic vectors. They have a length that is equal to the number of elements in the list. Data frames are one of R’s compound data types. They are lists of vectors, factors and/or matrices, all having the same length. It is one of the most important concepts in statistics and has equivalent implementations in SAS and SPSS. The example with the matrix shows that the elements in an array are stored in column-major order which is important to know when we want to access R arrays from a Java application. In both examples for the matrix and array objects, the class() function derives the class from the fact that the object is an atomic vector with the dim attribute set. Unlike data frames, these objects do not have a class attribute. Renjin has corresponding classes for all of the R object types discussed in the section A Java Developer’s Guide to R Objects. Table Renjin’s Java classes for common R object types summarizes these object types and their Java classes. In R, the object type is returned by the typeof() function. There is a certain hierarchy in Renjin’s Java classes for the different object types in R. Figure Hierarchy in Renjin’s type system gives a full picture of all classes that make up Renjin’s type system. These classes are contained in the org.renjin.sexp Java package. The vector classes listed in table Renjin’s Java classes for common R object types are in fact abstract classes that can have different implementations. For example, the DoubleArrayVector (not shown in the figure) is an implementation of the DoubleVector abstract class. 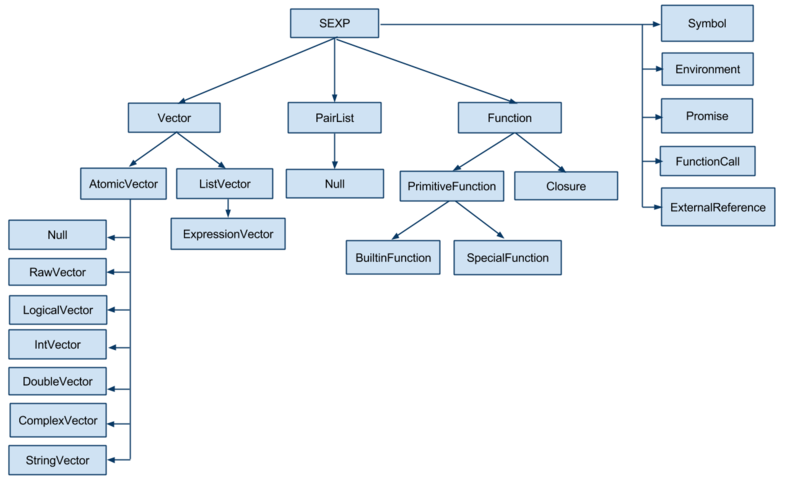 The SEXP, Vector, and AtomicVector classes are all Java interfaces. Renjin does not have classes for all classes of objects that are know to (base) R. This includes objects of class matrix and array which are represented by one of the AtomicVector classes and R’s compound objects factor and data.frame which are represented by an IntVector and ListVector respectively. Now that you have a good understanding of both R’s object types and how these types are mapped to Renjin’s Java classes, we can start by pulling data from R code into our Java application. A typical scenario is one where an R script performs a calculation and the result is pulled into the Java application for further processing. As you can see the getTypeName method of the SEXP class will return a String object with R’s name for the object type. Don’t forget to import org.renjin.sexp. * to make Renjin’s type classes available to your application. As mentioned in “Capturing results from Renjin” if you have more complex scripts, you can fetch individual values by their name. e.g. Now that we know how to pull R objects into our Java application we want to work with these data types in Java. In this section we show how individual elements of the Vector objects can be accessed in Java. As described in the section Matrices and arrays above, matrices are simply vectors with the dim attribute set to an integer vector of length two. In order to identify a matrix in Renjin, we need to therefore check for the presence of this attribute and its value. Since any object in R can have one or more attributes, the SEXP interface defines a number of methods for dealing with attributes. In particular, hasAttributes will return true if there are any attributes defined in an object and getAttributes will return these attributes as a AttributeMap. Result is a 3x3 matrix. For convenience, Renjin includes a wrapper class Matrix that provides easier access to the number of rows and columns. System.out.println("Result is a " + m.getNumRows() + "x"
EvalException: an exception thrown by Renjin when the R code generates an error condition, for example by the stop() function. The R script threw an error: Hello world! EvalException.getCondition() is required to pull the condition message from the R interpreter into Java. Like many dynamic languages, R scripts are evaluated in the context of an environment that looks a lot like a dictionary. You can define new variables in this environment using the javax.script API. This is achieved using the ScriptEngine.put() method. Renjin will implicitly convert primitives, arrays of primitives and String instances to R objects. Java objects will be wrapped as R externalptr objects. The example also shows the use of the DoubleArrayVector constructor to create a double vector in R. You see that we managed to put a Java java.util.HashMap object into the global environment of the R session: this is the topic of the chapter Importing Java classes into R code. © Copyright 2014–2019, BeDataDriven. Revision b72881ab. Theme based on the Sphinx theme provided by Read the Docs. Modified by Charis for BeDataDriven. Take a look at our package repository browser for the state of compatibility of CRAN and Bioconductor packages in Renjin. Check out the source code for Renjin on GitHub or the Renjin documentation on GitHub. Renjin is a project initiated by BeDataDriven, a company that provides consulting in analytics and decision support systems. Read about our support options for Renjin.